I just LOVE decorating for Halloween! 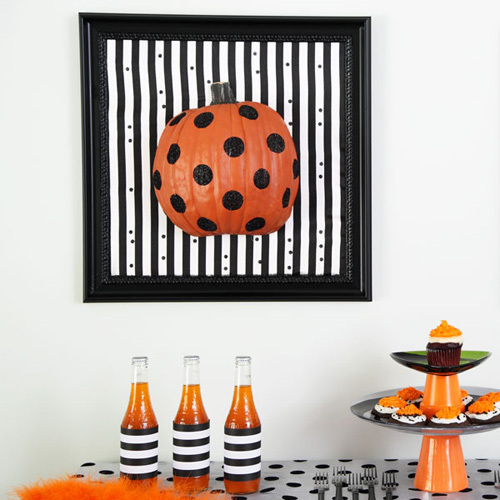 Here's a fun project I did for an iLoveToCreate photo shoot to match our Halloween food table. I love both polka dot and stripes and in this project, I got to create with both these looks! 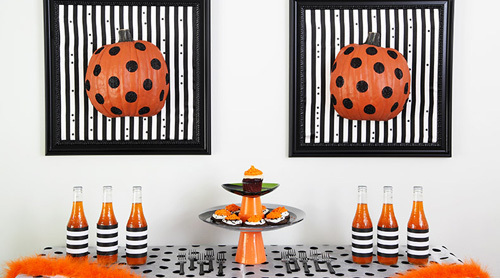 Halloween is one of my favorite times of year to decorate, because everything is so funky and fun! 1. 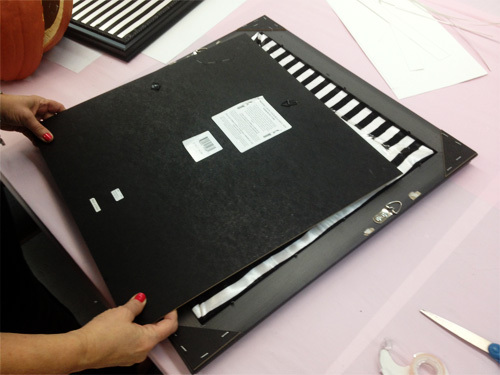 Remove the insert from your frame and tack out the paper/cardboard sheet. 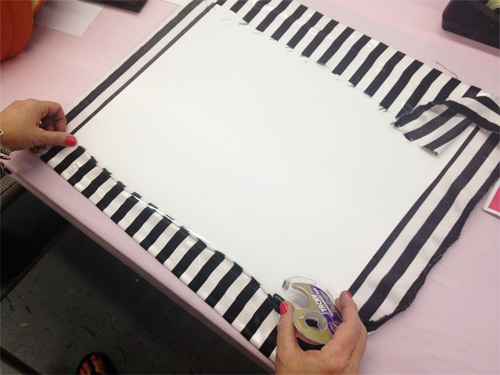 Cut a piece of fabric larger than the sheet and wrap it around. Use your Tacky Tape to hold it in place. 2. Put your fabric-wrapped cardboard back into the frame and secure. 3. 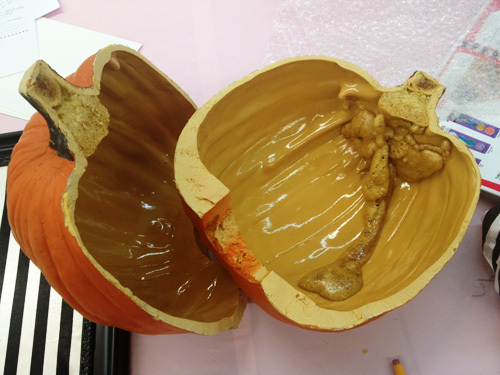 Use a craft knife to cut the pumpkin in half. 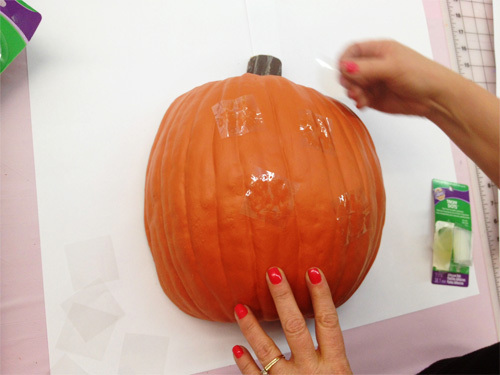 It's really easy to do, the foam pumpkin cuts like buttah! 4. 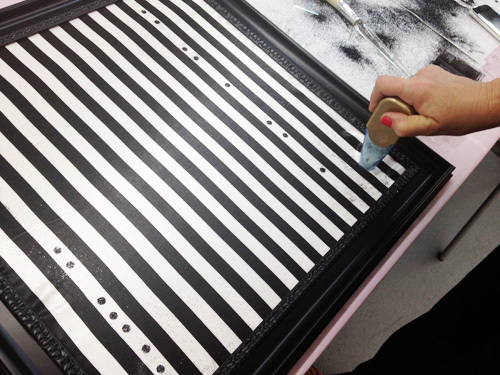 Open up the large Tacky Dots and remove from inbetween the plastic sheets they are seperated by. Apply randomly all over pumpkin. 5. 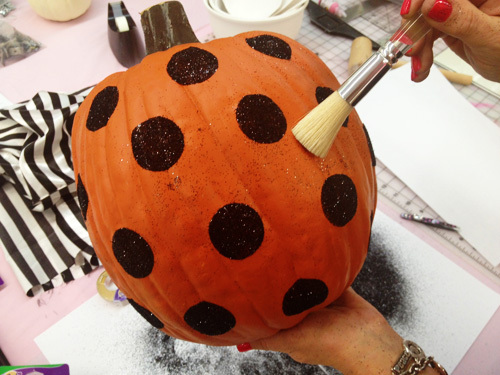 Pour the glitter all over Tacky Dots and shake off onto a sheet of scrap paper. 6. 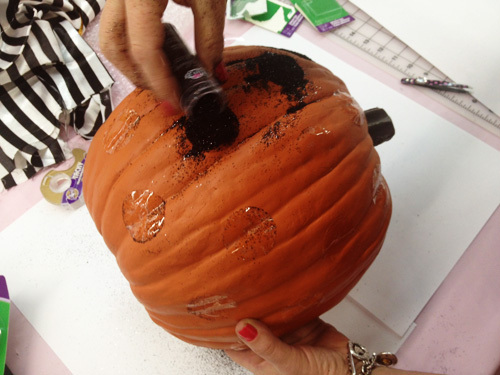 Use a large brush to remove any excess glitter. Don't the dots look great? 7. I chose to further embllish the stripes with some random Tacky Dots using the Tacky Dot Dotter. I sprinkled on and shook off the glitter as I went. I went back in and used the brush to remove glitter when I was done. Now frame and enjoy your creation! I actually did 2 framed pumpkins with my two halves. They looked perfect with the Halloween table we set up!! very amazing.. i love it, i want to try it and i want to hang it on my kitchen..very artistic..